I cannot get started with my new Nitrokey Storage stick because the instructions do not follow what is on screen. 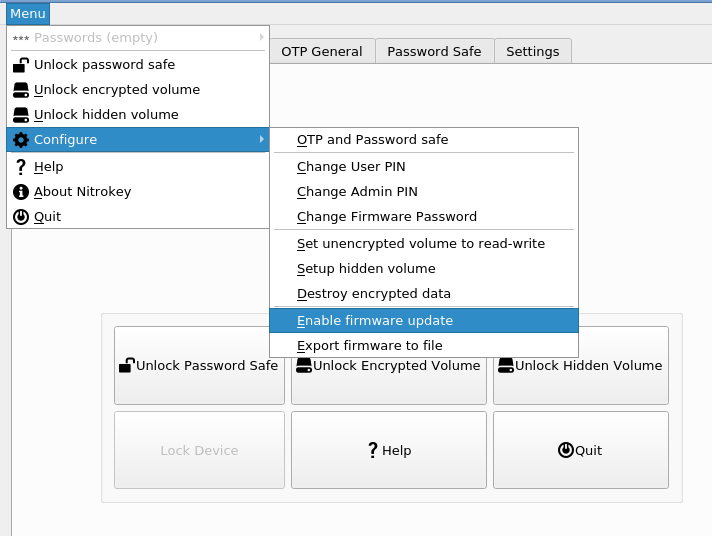 I have the openSuSE repo version of nitrokey-app and dfu-programmer but I simply cannot find the firmware update command anywhere and there is no window image similar to any shown in the instructions. It appears also that nitrokey gui does not run from root. I have tried in a 32 bit linux machine using with Antix which is Debian based and I can at least find the firmware update button but still do not see any record of firmware now installed so cannot see whether I need to update or not. Serious absence of instructions so please could I have a step by step guide. please tell me what exactly you did and what you want to do. It sounds like you used the Nitrokey App and clicked on “Enable firmware update” (see below), is that right? In this case you must follow the steps described here. In the very bottom of the page you can read the instructions for Linux systems. Please make sure that you download the firmware and rename it to firmware.hex.